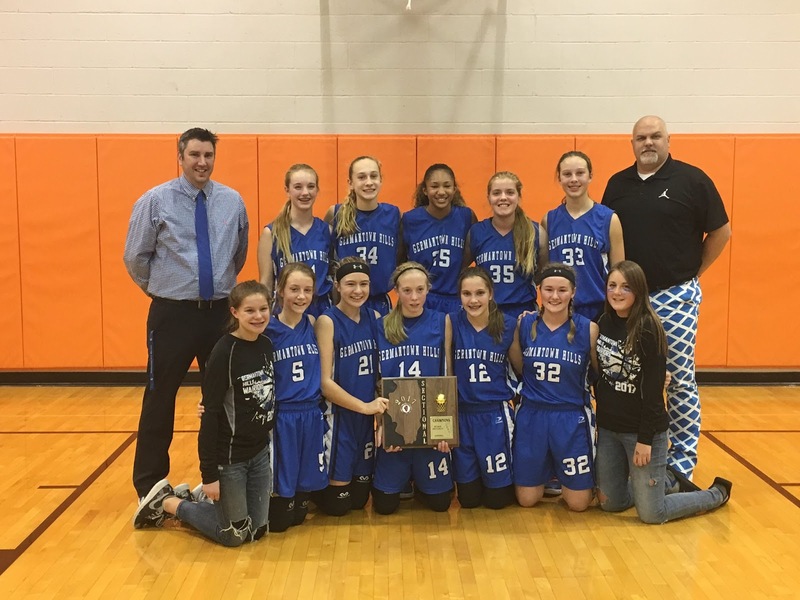 The 8th Grade Germantown Hills Warriors Girls Basketball team poses with their 3A Sectional Plaque. Washington, IL - The Germantown Hills Warriors 8th Grade Girls Basketball team (21-2) had an important sectional championship game against El Paso-Gridley (17-5) Wednesday night at Washington Middle School. 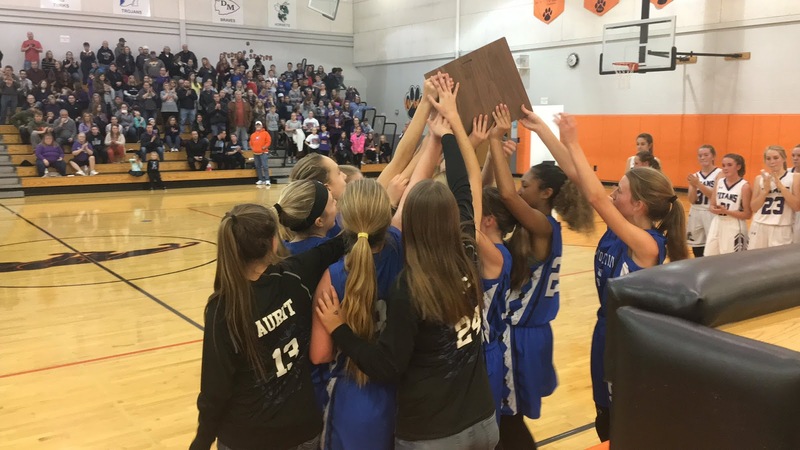 The 8th Grade Warriors were familiar with the gym at Washington Middle, having just won a regional championship there just six days prior to Wednesday's game. Things got off and running for the Warriors. AJ Taylor was a major factor in the first quarter, scoring six of the 9 Germantown Hills points through the first six minutes. El Paso-Gridley struggled to get shots to fall, and that would give Germantown Hills a 9-2 lead after the opening frame. The second quarter saw the Titans' offense come back into frame, as three girls got in the scoring column. However, a 4-point quarter from the Warriors' Kayla Pacha, as well as baskets from Sydney Beccue and Alyssa Russell kept Germantown Hills in front headed into the halftime locker room, but only by 9 points, 17-8. 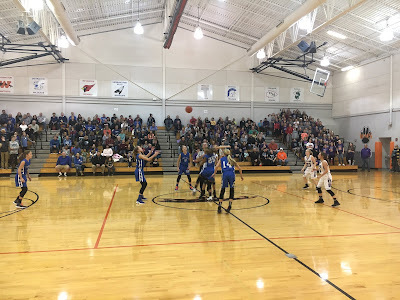 The Warriors really put their foot on the gas in the third quarter, holding El Paso-Gridley scoreless, while forcing turnovers that eventually lead to the Titans calling a timeout, with three turnovers having been committed in the first three minutes of the second half. 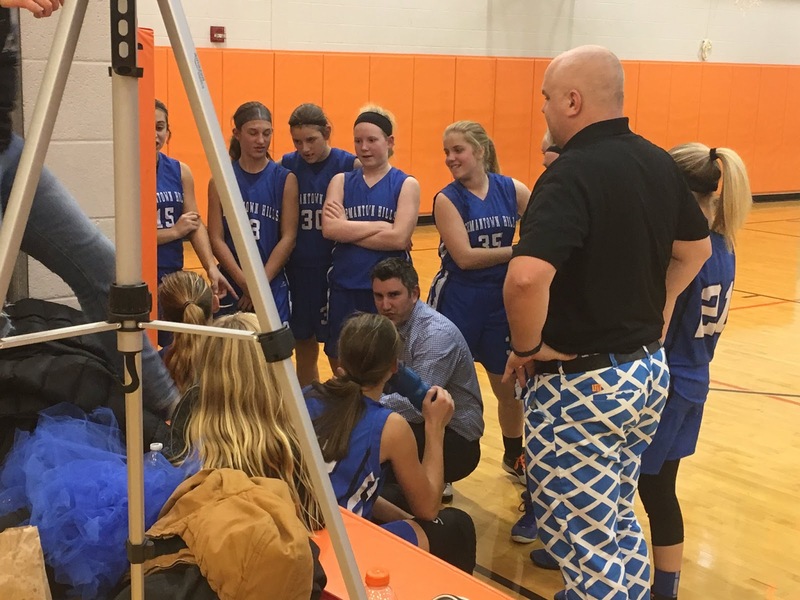 Germantown Hills was lead in the third quarter by Alyssa Russell, who had a five-point quarter, to go along with a three from Beccue and a two-pointer from Kayla Pacha. The Warriors had a commanding 27-8 lead with just six minutes separating where they were in the game from a trip to the State Finals. The final quarter didn't see all that much scoring, but it wasn't needed on the part of Germantown Hills. The Warriors, having a 19-point lead headed into the fourth, just needed to play defense they way they had the first 18 minutes, and they did just that. Outside of a few trips to the free throw line, the Titans didn't get the shots that they would've needed to have any chance of coming back and knocking off the Warriors. 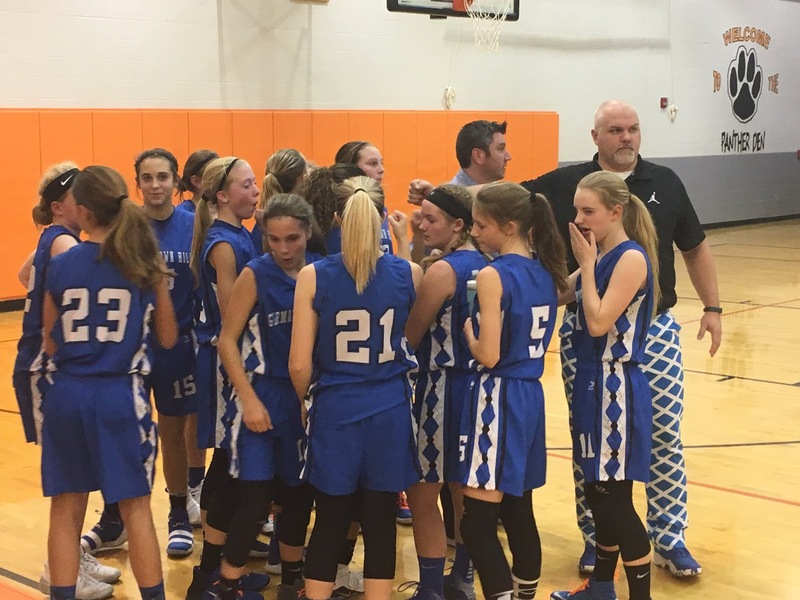 By the final buzzer, Germantown Hills would be making their second consecutive trip to the 8th Grade State Finals, beating El Paso-Gridley, 34-9. 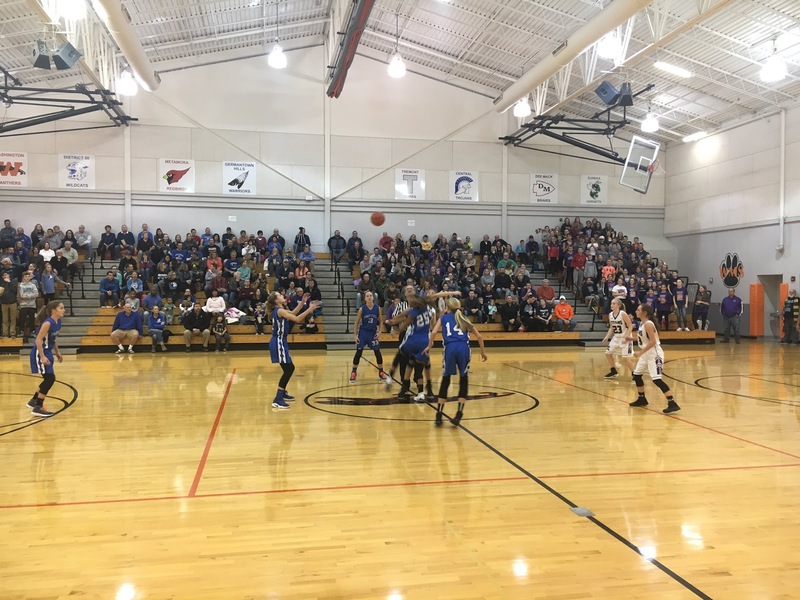 After the game, Head Coach Ryan Davis was very pleased with his team's effort, particularly that defensive pressure that forced numerous El Paso-Gridley turnovers. "They (El Paso-Gridley) made some good adjustments after halftime on our press. So we took it off." Coach Davis also thought the turnovers from El Paso-Gridley had to do with something he's been teaching the team all season. "We always preach, first three minutes, set the tone in the second half. We went back to our press, and that kind of caught them off guard." The Warriors had quality games from two players in particular, both of whom were getting good shots down low. 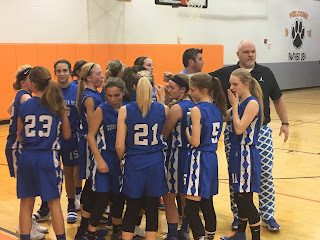 Coach Davis had a lot of praise for them, as well as the other three girls on the floor. "It's unbelievable. Both her (AJ Taylor) and Kayla Pacha. It's like having five guards out on the court and they're all so very quick." The Warriors will play on their home floor for the State Finals, something Coach Davis is extremely pleased about. 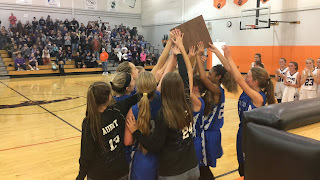 "To have it at our school and to have a team in it... Very excited to be having our home court advantage, our fans right there with us." The 7th Grade Warriors play for a State Championship tomorrow night against Havana. That game is at Auburn High School in Auburn, Illinois. Tipoff is at 7:30 pm. The 8th Grade State Quarterfinal is this Saturday, December 9th, at 2:30 pm. The Warriors will play Farmington Central. It's been a season-long mission for Germantown Hills, and when asked about that mission, Coach Davis just kept it simple. "This is what we've been waiting for."